An incredible, must-see cultural experience, the Nozawa Onsen Fire Festival is held annually on January 15th and sets the night sky ablaze. 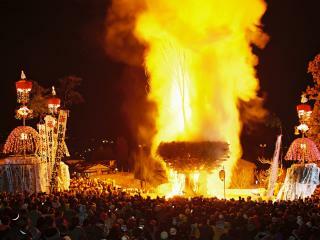 Celebrating prayed for good fortune, wellbeing and a plentiful harvest, the festival ignites the night sky and rages through the night with fire, food, Japanese sake and good cheer, culminating in torch-bearing villagers ‘battling’ wooden fort barricades to burn them down. 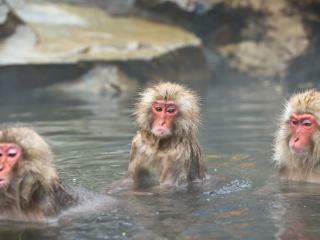 A rare chance to see around 200 of the famous snow monkeys in the wild, bathing and warming themselves in the natural hotsprings. This tour also includes a traditional Japanese set lunch and a visit to the ancient sake brewery Masuichi Sake Brewery for tastings of a number of different Japanese sake. The tour also takes you to Nagano City and the designated national treasure of Zenkoji Temple.